AHN Cheol-soo all but declared his candidacy for this year's presidential elections, a race until now dominated by PARK Geun-hye, and where only he is perceived as a potential game changer. 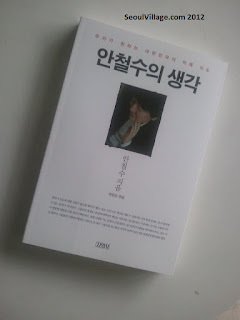 A book-program-interview ("안철수의 생각" / "Thoughts of Ahn Cheol-soo") flying off the shelves, instantly followed by a show on SBS ("힐링캠프" / "Healing Camp") drawing an audience twice as big as that of rivals PARK and MOON... it only took a couple of days for him to introduce himself to those who didn't know him well. MOON Jae-in obviously didn't make the most of his time as an official candidate, and the times when he was in virtual ties with PARK in the polls seem long gone. PARK herself lacks charisma. Always dodging touchy issues, she's leveraging on the admiration of elder generations of conservatives for her father, but she never achieved anything beyond backstage politics and frontstage firstladyhood following the death of her mother during an assassination attempt against her father. AHN has a clear opportunity to reform and reunite the nation if he manages to build a platform consistent with his values, reaching across Korea's utterly divided aisle. More than a few conservative lawmakers may even follow him.
. Facebookally, MOON Jae-in leads with 18,073 likes compared to 10,444 for AHN and 4,875 for PARK. 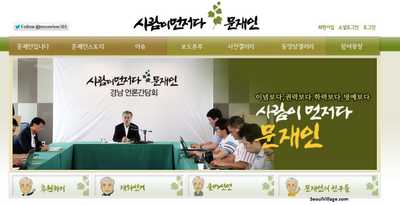 On the other hand, websites seem to mirror their candidates: fun and open for AHN (ahnsamo.kr), paramilitary in English or Kimjongilesque in Korean for PARK (parkgeunhye.or.kr), and very kind, but somehow boring for MOON (moonjaein.com).